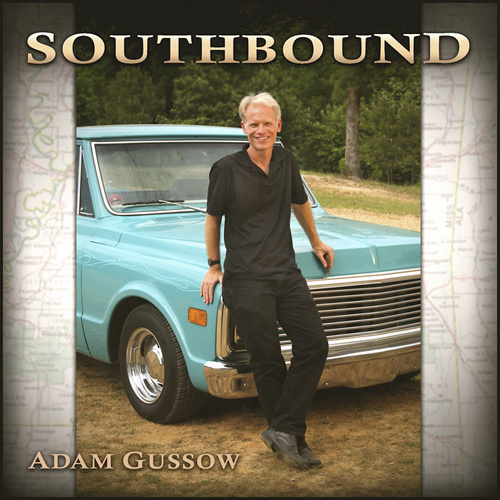 Southbound is the title of Adam Gussow's new solo album, the title of the opening track, and the story of Gussow's life. A stalwart of the New York City blues scene for many years as the harmonica-playing half of the duo Satan and Adam, Gussow relocated to Oxford, Mississippi almost a decade ago. In 2010 he surprised the blues world with his clanking, driving, rough-edged solo debut, Kick and Stomp. "[R]ooted deep in the blues," wrote the reviewer for Living Blues, "Kick And Stomp adds a unique and captivating new chapter to Gussow's 35-year professional musical career." Now, with Southbound, Gussow ups the ante once again. Nine of the album's eleven cuts were tracked in one-man band mode, but all of them have been bluesed, funked, and jazzed up with the help of Mississippi's best session men--including another New York outmigrant, Bronx-born bassist Jerry Jemmott, the groovemaster celebrated for his work with Ray Charles, Aretha Franklin, B. B. King, King Curtis, and the Allman Brothers. Those who know Gussow as a harmonica player will be surprised to learn that he plays guitar on more than half the tracks. "I was as passionate about guitar as harmonica during my late teens," notes Gussow. "I worked my way through college in a jazz/funk sextet and studied jazz guitar at Berklee. Larry Carlton, Eric Clapton, Joe Pass, Dickey Betts, and B. B. King were my heroes." All these regional and stylistic influences are evident in the richness of Southbound's offerings, which range from urban and country blues (Tore Down, C. C. Rider, You Dont Have to Go) through contemporary smooth-jazz instrumentals by trumpeters Chris Botti (Why Not) and Rick Braun (Green Tomatoes) that Gussow has roughed up and reclaimed. With Jemmott's help, Gussow transforms South African trumpeter Hugh Masekela's 1968 pop-jazz favorite, Grazing in the Grass, into a down home disco groove with some bump-in-the-trunk. Gussow's harp virtuosity shines on two tracks: a bluesy remake of the Sanford and Son theme (with Mississippi jazz man Bill Perry, Jr. on keyboards) and Alley Cat, an early 1960s lounge hit by Danish pianist Bent Fabric that becomes an overblow-strewn workout. Southbound is anchored not just by the title track, a harmonica-powered version of the Allman Brothers's classic, but by two of Gussow's original compositions. Home to Mississippi celebrates the life of a traveling musician with a rockabilly groove and juke-joint harp. Old McDonald in Mississippi slyly re-envisions the familiar nursery rhyme as a double-entendre, adults-only meditation on "frolicking rural farmlife" in the Deep South. Marking the arrival of a mature talent with a Harlem pedigree and an expansive vision of the dirty-South blues, Southbound solidifies Gussow's reputation as one of the most powerful and accomplished harmonica players in the world today. NOTE: This zip file contains 11 WAV files (42 minutes' worth of music) plus a PDF "print-and-trim" version of the liner notes. The liner notes include harp keys for all tracks, in case you'd like to jam along. ADDITIONAL NOTE: This is a LARGE zip file (more than 400mb) and requires a high-speed internet connection for optimal downloading. in a league of his own. outsttanding.